In helping candidates prepare for Selection, we’re going back to the basics and hitting on and revisiting all of the topics that generally give candidates the most issues. The three biggest issues that stop candidates from being selected, and are foremost on their minds (judging from the emails we get) are Physical fitness preparation, rucking and land navigation. After the first few days of Selection, you’ll get to experience the Land Navigation course firsthand, and if that happens to be the Star Course in Hoffman, NC at SFAS, then you’ll experience all three in the toughest individual land nav course in the military. But as we’ve stated, the biggest failure is the failure to prepare. If you are properly prepared, there is no reason you can’t do what thousands of Special Operations Forces troops before you have accomplished. It is more of a mental block than anything else. Our physical training program which we publish daily will help you attain the level of physical fitness that you’ll need to not just pass the course but to excel. 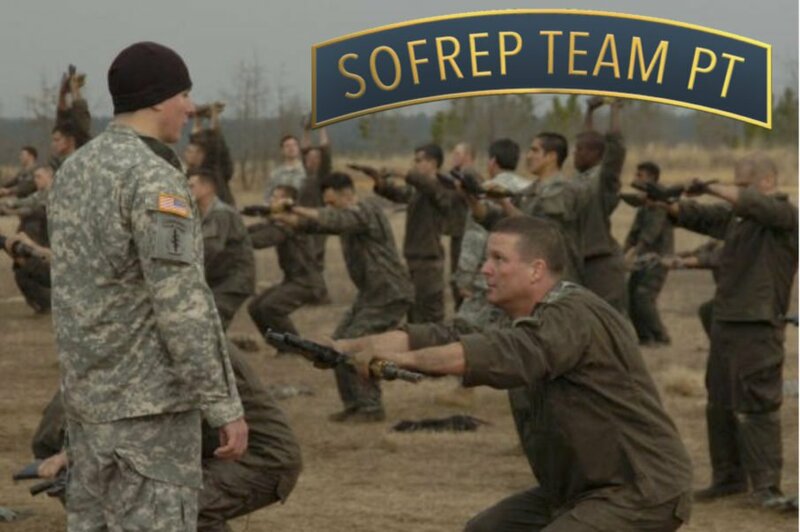 It is a 17-week preparation for the rigors of Selection and starts slowly, works its way up to where you should be ready to go. Included in that is plenty of rucksack marching. We’ll revisit some more rucking tips in the very near future as well. Which brings us back to the Land Navigation course. The Legend of Diablo – One of the first classes we ran in at SFAS back in the fall of 1988, a class was getting ready to start a practice night navigation run when one of the candidates, who’d been acting really squirrelly, told the cadre member at his point that he couldn’t go out that night because Diablo (aka the Devil) was waiting for him. The cadre member at first was dismissive of the young candidate, but then realizing he was legitimately freaked out, tried explaining that while the great Satan may exist, he’d never been seen in Hoffman, although most candidates would argue that he designed the course. The cadre member called it in and two of the roving vehicle cadre members pulled up to the point and after a few minutes, they had the young, scared candidate out on the course. The point being, if you can’t go out on your own navigating in the dark, Diablo or not, you can’t be in SF. So off he goes. Thirty minutes later, the same candidate returns to his start point, totally freaked out and covered in blood, not his own. The stock of his weapon was cracked, covered with blood and hair. The candidate tells the cadre member that the ground opened up and Diablo tried to pull him into hell. The call went out and every rover flew over to that point. The kid refused to go back to where he killed “Diablo” and the cadre tried to retrace his steps. In just a few minutes, they found the spot where the area looked like a mass murder had taken place. Fearing the worst, the flashlights came on and they reported back. As the candidate was busting thru the underbrush, hearing his approach, a young deer, a fawn had gone to ground. The unlucky candidate actually paused directly over it. When he turned on his red lens flashlight, the fawn spooked and leaped to its feet, actually coming up between his legs. The kid then proceeded to bash the deer’s head in to where it was unrecognizable. It had to have been more than 50 blows from his weapon. Blood was everywhere. The cadre members carried the poor unfortunate fawn back to the point where no amount of persuasion would convince the candidate that Diablo didn’t “come out of the ground” to get him. He was done. And was gone quickly. While Hoffman may seem like the Devil’s playground, you won’t have to worry about him coming out of the ground. So, without further ado, we are on to one of the most basic of skills in moving during navigation, and that is your pace count. Having an Accurate Pace Count is Very Important: To be successful during the land navigation course requires, plotting the points accurately, planning a good route (which we’ll get to soon) and having an accurate pace count. In certain areas, with very distinct terrain features, your pace count isn’t as important because you can pinpoint your location by identifying the surrounding terrain. But in places like Hoffman where terrain features are very indistinct, knowing your pace is very important because you’ll need to know how far you’ve traveled. The first thing you must do is to set up a 100-meter course on flat terrain. Walk it three times and every time your left foot hits the ground, count it. Take the total number of steps you’ve walked and divide by three. That is your baseline pace count. If you are near a track or a football field, you can use that or just take a spool of 550 cord and mark out 100 meters and put some knots in it or tape it to keep the correct distance You’ll thank me later. Now wait until dark and walk the flat course again, three times. Your pace count will probably increase in the dark, keep a notation in your notebook that should always be in your pocket. Mark down what your pace count is for daylight on flat terrain and your night pace count. Now take your 550 cord out into the woods and try to find some rougher, hilly terrain. Lay out the 550 cord and walk the course again three times in the day and three times in the dark. Did your pace count increase with the difference in terrain? It should have. Now complete this exercise again in the woods but with a rucksack on and repeat the steps in rough hilly terrain, day and night. Your pace count should increase dramatically with a heavy rucksack on especially once you start hitting hills and thicker vegetation. Remember, if you plan to use your Ranger beads every time you travel 100 meters. Slide the lowest bead to the bottom. Most of them come with nine beads after you slide nine down, the next 100 meters brings you to a klick and you can push them all back up to the top. I highly recommend using them or making your own out of 550 cord, it is a valuable tool and comes in handy so that you don’t have to remember exactly how far you have to go and how far you’ve gone. Remember this…your pace count is just a piece of the puzzle. You have to plot your points correctly and get an azimuth to where you are going. Your pace count should give you a very good reference point as well as using terrain association off of your map. A couple of things to consider, when the weather turns on you, and it will, the rain, snow or sleet will cause you to take shorter steps and increase your pace count, especially at night. Exhaustion will do the same thing. As you get tired during the course or during a field training exercise, your level of exhaustion will increase your pace count even if moving during daylight hours in open terrain. In time, you’ll become a seasoned pro at this and will know just by the conditions that you are dealing with what your pace count will be. And it will change over time. My pace with just web gear on flat terrain was 62 back in the days of Phase 1 at Camp Mackall. But with a rucksack and a heavy load, it went up to 73. But I noticed after I had been in Group for a while and your rucksack becomes a part of your body, my pace counted lessened to between 68-69 depending on conditions. You’ll find that you will have similar results. Another tip on pace counts. If you plot your point and you have 4 kilometers (klicks) between points, don’t try to keep a pace for the entire distance. Pick out a terrain feature or road intersection as an attack point. Use deliberate offset (More on that later) to find it. Keep your pace count to that attack point and make a notation with a grease pencil on your map case. If any of your fellow students or training partners have been in either the Ranger Regiment or an Airborne or Light Infantry unit, they’ll probably have some experience doing this. It is a great way to check your pace and see how close you come to your plotted points. By the time you finish Selection and the subsequent qualification course, you’ll find you pace counts and distances are coming really close to the distances when you plot them on your maps. But failure to keep a pace count can really hurt you if become disoriented, especially in the dark. It is a valuable tool that every successful SFAS candidate should use while you’re out on the course. So, when navigating, keeping an accurate pace count is not only a helpful aid but essential. If you find that you’ve drifted on the course, the distance traveled will definitely help get back on track and find your points. Failure to prepare will result in course failure. And getting lost is the ultimate embarrassment. That will get you a red face when the cadre has to search for you and usually ends up with the candidate doing the long walk to the trucks back to Ft. Bragg. The last thing you want to see is your rucksack in the hallway. We’ll get to some more Land Navigation tips and some important Map Reading do’s and don’ts in some of our upcoming articles soon. Until then, if you have any questions, feel free to email me [email protected] or Tweet them to me (@SteveB7SFG) and I’ll be happy to answer them. Either privately or in a post such as this (without naming names).